Mohammed Isaq, owner of luxury wedding venue Haslington Hall in Crewe, Cheshire, has received a jail sentence after he committed fire safety breaches and put the public and his staff at risk of death and serious injury. Mr Isaq, aged 56, had been previously warned by Fire service officials about the fire safety breaches at the venue and had been ordered to close the building. But despite these warnings, he chose to ignore the prohibition notice that had been issued on at least three separate occasions. Weddings were still taking place when Cheshire Fire and Rescue Service visited the venue. As a result of his ignorance, Mr Isaq, of Hale Barns was sentenced to 20 months in jail at Chester Crown Court. Haslington Hall was constructed in the 1500s and was part timber in construction. It was used as a luxury wedding venue and offered overnight accommodation for guests. Mr Isaq’s failure to take the necessary fire precautions put his employees and the public at serious risk of injury or even death. Cheshire Fire and rescue service inspected the building and found evidence of inadequate fire detectors, firefighting equipment, alarms, signage for emergency routes and exits, escape routes and staff were not adequately trained in fire safety. The fire service had visited the Grade I listed building back in 2012 and issued enforcement notices, in hope that the necessary works would be carried out to meet the standards required. However, the enforcement notices were ignored in due course by Mr Isaq. The fire Service visited again in 2014 to carry out a further inspection and condemned a structure known as “The Big Marquee” within the grounds of Haslington Hall due to breaches in fire safety. Again, they issued a prohibition notice saying that the venue must not be used. They visited on a further 3 different occasions and found the marquee to still be in use for weddings, despite their warnings about the serious risk to the public’s safety. This was not the first time that Mr Isaq had breached fire safety regulations. After pleading guilty to the fire safety breaches and was ordered to pay court costs totalling £23,815. 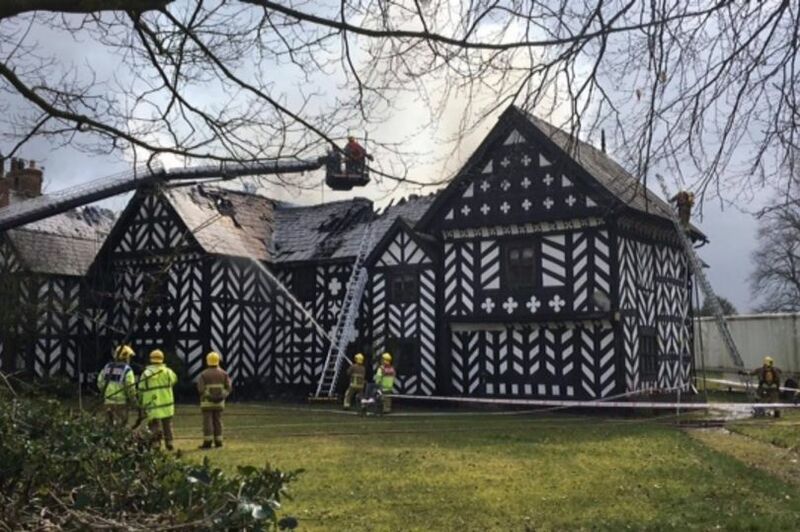 The inevitable eventually occurred on 24th March 2018 when a huge fire broke out at Haslington Hall. Luckily, nobody was injured in the blaze, despite 6 different fire crews in attendance due to the size of the fire. Don’t be like Mr Isaq and risk committing fire safety breaches. Make sure you are fully compliant with current legislation and protect yourself, your employees and the general public from serious harm. At Total Site Safety we provide a range of Fire retardant clothing, Site Safety equipment, Fire Exit signs. Assembly point signs, Fire equipment signs and smoking area signs to aid you when it comes to fire safety in the workplace. If you need any help or advice on fire safety products then just give us a call on 0330 0885 675 and we’ll be happy to assist. This entry was posted in Health and Safety News and tagged assembly point signs, fire equipment signs, fire exit signs, fire retardant clothing, Site Safety Equipment, smoking area signs.